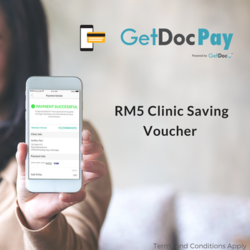 Enjoy RM5 off on your next medical bill when you volunteer with ImpacThor at least once! Saving Code will be emailed directly to qualified volunteers. No need to make a redemption here. Step 1: Volunteer through ImpacThor at least once. Step 2: ImpacThor will email you the Saving Code. Step 3: Launch GetDoc app and click on "GetDocPay"
Step 6: Key in saving code that was sent to your email. Saving Code is only applicable via mobile app. Usable for consultation, medication, health-check and others, as long as used with GetDocPay. To be used at GetDoc's panel clinics using GetDocPay. Visit link for more details: http://says.getdoc.co/GDPPanelClinics. Volunteers will be able to save RM5 on their next clinic visit at our panel clinics. Valid for one time and first time use. Only applicable with minimum spending of RM10.